under the small umbrella: Antonio Banderas hits Gold! Warner Bros. has just sent over the epic official UK trailer for Black Gold, starring Tahar Rahim, Mark Strong, Antonio Banderas, Freida Pinto and directed by Jean-Jacques Annaud. Under the unforgiving desert sky, two warring leaders come face to face. The bodies of their warriors litter the battlefield. 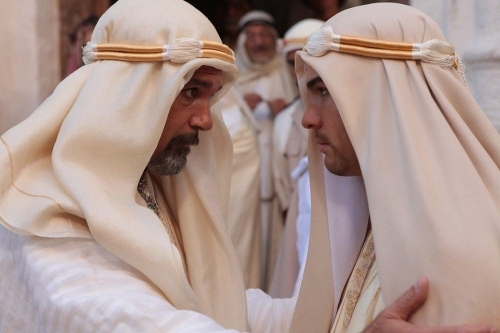 The victorious Nesib, Emir of Hobeika (ANTONIO BANDERAS), lays down his peace terms to his rival Amar, Sultan of Salmaah (MARK STRONG). The two men agree that neither may lay claim to the area of no man’s land between them called The Yellow Belt. In return and according to the tribal customs of the time, Nesib will “adopt”- or take hostage- Amar’s two boys Saleeh (AKIN GAZI) and Auda (TAHAR RAHIM); a guarantee that neither man can invade the other. Years later, Saleeh and Auda have grown into young men. Saleeh, the warrior, itches to escape his gilded cage and return to his father’s land. Auda cares only for books and the pursuit of knowledge. One day, their adopted father Nesib is visited by an American oil man from Texas (COREY JOHNSON). He tells the Emir that his land is blessed with oil and promises him riches beyond his imagination. Nesib imagines a realm of infinite possibility, a kingdom with roads, schools and hospitals all paid for by the black gold beneath the barren sand. There is only one problem. The precious oil is located in the Yellow Belt. Saleeh is killed in his attempts to escape and return to his father’s kingdom. The task of negotiating peace between the two kingdoms falls to young Auda. Nesib orchestrates the wedding of his beautiful daughter, Princess Leyla (FREIDA PINTO) to Auda. Though that union is borne of political convenience, ridding Nesib of his final obligations to his peace treaty with Amar, for Auda and Leyla their marriage is the symbol of a new beginning, a love that began in their childhood and the chance to shape the world around them. Auda is sent to Salmaah as an emissary of peace. Reunited with his father Amar, he discovers a new outlook on life, one based on devotion, piety and humility. His father offers him a seemingly impossible task, to cross the forbidding desert landscape of the House of Allah, along with his half-brother Ali (RIZ AHMED), as a decoy with nothing more than a ragtag army of thieves. The idea is to trick Nesib and allow Amar to mobilise his real army and conquer the kingdom of Hobeika. Through his journey, which is filled with many spectacular battles against rival tribes and clansmen and sees him free the beautiful slave girl Aicha (LIYA KEBEDE), Auda is transformed from a librarian into a leader. The stage is now set for an epic showdown for control of the Yellow Belt, for control of the two kingdoms, for control of the future.